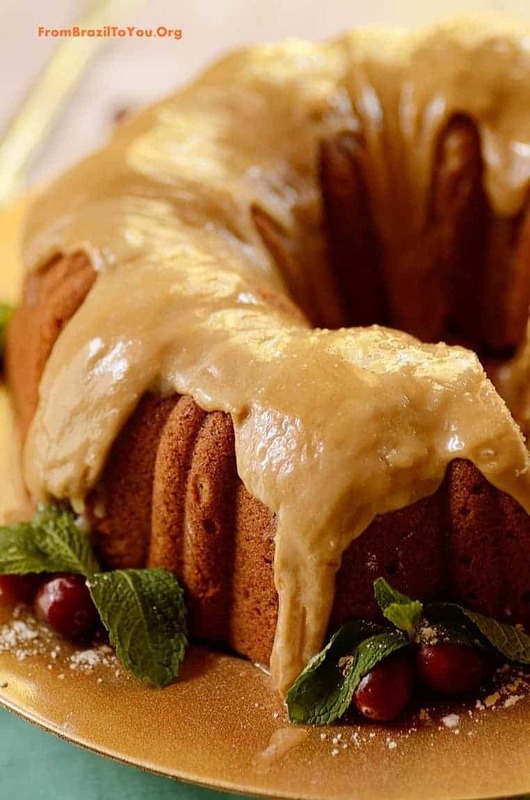 It’s all about Thanksgiving… including this marvelous Spiced Sweet Potato Pound Cake with Caramel Frosting (Bolo de Batata Doce com Caramelo)! I know — just thinking about it makes my mouth water. But it’s fine, one has to enjoy the season’s goodies. Moist, comforting, aromatic, and festive are this cake’s real names. Folks, this was a hit in my household and it will be in yours as well. 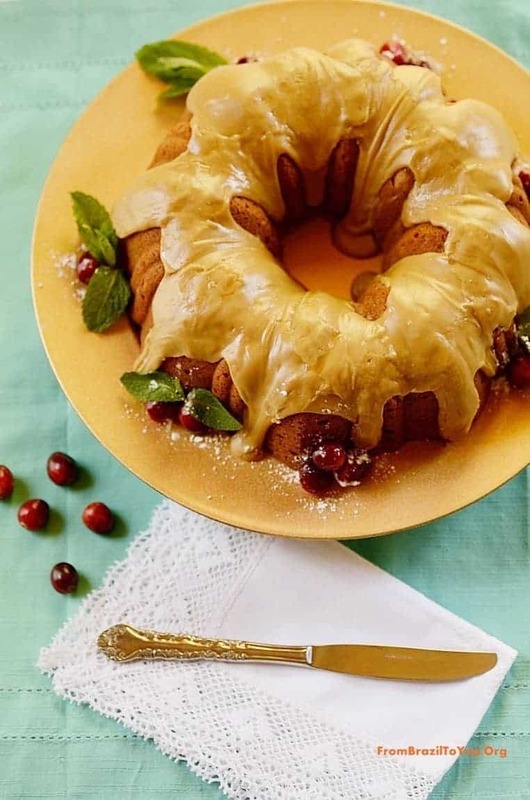 If you are already planning your Thanksgiving menu, add this cake to your list of desserts. Mine includes a variety of desserts: pies, a cake, and either cookies or another type of dessert. Do it… and you won’t regret a thing! 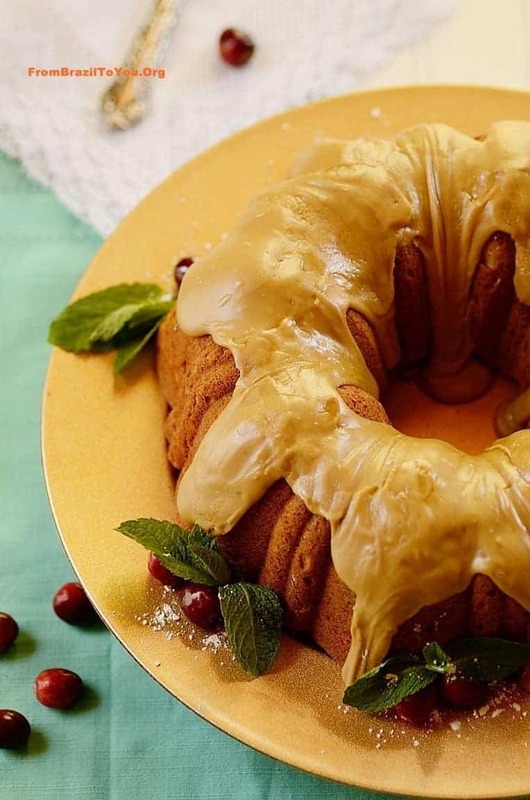 The sweetness of the homemade caramel balances well with the mild flavor of the cake. The spices make this a warm, comforting dessert, and the sweet potatoes and the caramel capture the spirit of the season. 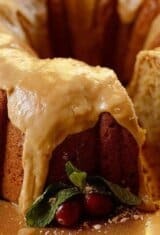 A gorgeous, moist, comforting, and aromatic Spiced Sweet Potato Pound Cake with Caramel Frosting. What's not to like about it? Preheat oven to 350 degrees F. Grease and flour a 10” tube or bundt pan, and set aside. In the bowl of an electric mixer with a paddle attachment, cream butter and then add the sugar, beating at low speed until light and fluffy, about 3-4 minutes. Add eggs, one at a time, beating after each addition at low speed until just incorporated. Scrape down the bowl after each addition. Add the buttermilk and beat just until incorporated. Batter will look lumpy. In a separate bowl, combine flour, salt, baking powder, baking soda, and spices. Slowly add the flour mixture to the potato mixture at low speed until combined. Beat in the mashed sweet potatoes and vanilla. Pour the batter into the prepared tube/bundt pan and level uniformly. Bake for 55-70 minutes or until a toothpick inserted comes out clean. Cool on a wire rack for 20 minutes, then invert onto a serving plate. 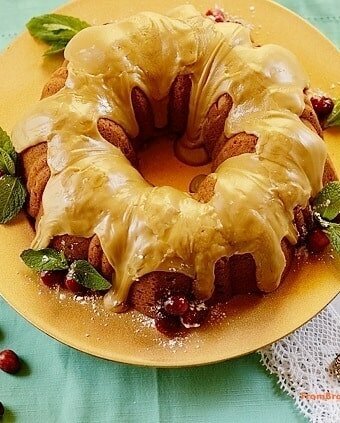 Once cake has cooled completely, prepare the caramel frosting if desired. 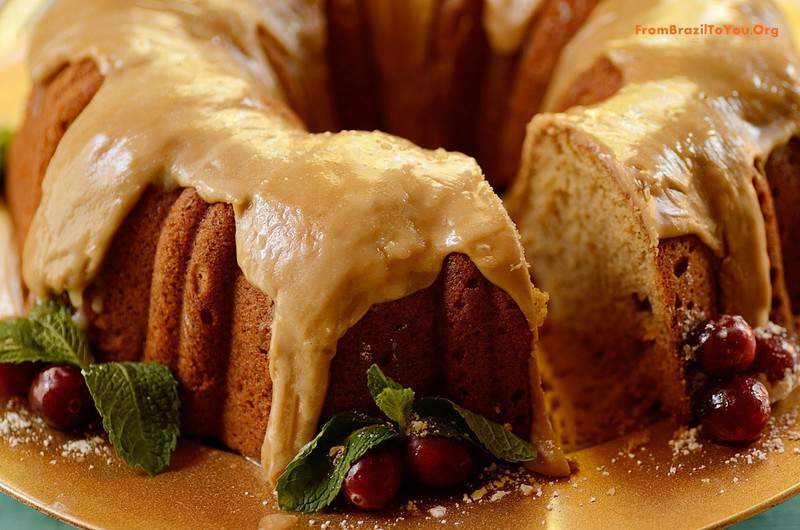 Our sweet potato pound cake can be served plain, or topped with the Caramel Frosting. For the Caramel Frosting: Bring brown sugar, heavy cream, and butter to a boil in a small stainless steel saucepan over medium heat, whisking constantly. Boil, whisking constantly for about 1 minute. Remove pan from the heat and stir in vanilla. Gradually whisk in powdered sugar until smooth. Continue to stir mixture until it just begins to cool and thicken. Immediately pour mixture over cooled sweet potato pound cake and let set. Decorate sides with fresh cranberries and mint leaves, or as desired. OMG! This is gorgeous Denise. You have convinced me to try out sweet potato in a cake. I’ve always wondered if it works. And that caramel frosting! I can eat it just like that. Bookmarking this…will make soon! I am so sorry, Sonali! I will take a look at my sharing buttons and hope to solve this problem soon. Thank you for letting me know. Fabulous Bundt Denise! A wonderful autumn treat, the new crop of sweet potatoes just arrived at the market. The caramel frosting is sublime! Woow, great minds think alike 🙂 I’ve just posted about sweet potato cookies one of my favorite. I bet this one will be a fav. too. I used to replance pumpkin by sweet potato, and that is because sweet potato is more accessible for us during all the year. The cake looks so beautiful and delicious, Denise! What a great idea! I have never tried sweet potatoes in cakes! But will have to give this beauty a try. I guess this would be the perfect Thanksgiving dessert! Cheers! This looks wonderful! Such a gorgeous looking cake. Love to cook (and bake!) with sweet potatoes — this looks like such a fun dessert. Thanks! So darn pretty Denise. I have been working up the courage to cook chocolate cake with avocado, a sweet potato cake is now on my list of must get onto making too. Loving that savoury ingredients are making there way onto the dessert menu. Although that prob isnt a new thing huh? In my family, it isn’t Thanksgiving or Christmas without sweet potato pie, sweet potato pudding etc. I will be making this for my daughter’s first birthday cake because she loves sweet potatoes and her birthday is Christmas. 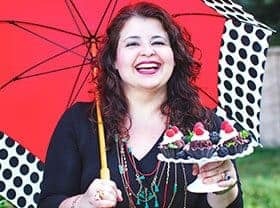 This is the best cake recipe I have found so far. Thanks for sharing! Tantee, thank you for stopping by. I hope your daughter enjoys the cake. Wishing her a very happy b-day. That’s an incredible cake dear Denise! We haven’t tried sweet potatoes in a cake before and we really want to do that asap:) Do you refrigerate the cake (since the frosting has whipping cream)? Thank you for this delicious dessert, have a beautiful week! Hello, friends! Thank you for topping by. No, you don’t refrigerate the cake. It is stored, covered, at room temperature. The caramel frosting is cooked this is why there is no need for refrigeration. Sending you both greetings from Texas. I used sweet potatoes in baking before, it gives a nice texture at the same time keeps the moisture. I bet this is the same, love your recipe. This cake looks stunning! I bet it was delicious, Denise! Wow! This takes the whole sweet potato dessert thing to another level! Yum!